Just now, I have an APS seminar with the General Manager of Transportation Services for the City of Toronto, Gary Welsh. We discussed on, what difference would it be in the traveling system the next 30 years? Let go back 30 years ago, people never expect what would happen in the next 30 years. People didn't expect that we can have cellphones, fast internet, color television, and computer today. 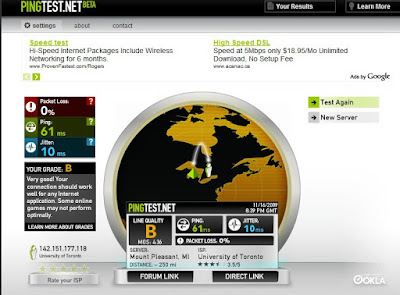 Pingtest.net is a tool to check the quality of your Internet connection. It gives feedback on your connection as streaming media, voice, video communication and online gaming require more than just raw speed (Pingtest.net). All the best SPM 2009! InsyaAllah, next Wednesday will be the first day of SPM examination 2009. I pray the best for all of you, and I hope that your efforts bear fruits. All the best! Hereby, I attach a video - "Choosing the Right Path" - a motivational program at Sepintar organized by Icpu Today's Helmi Khaled.